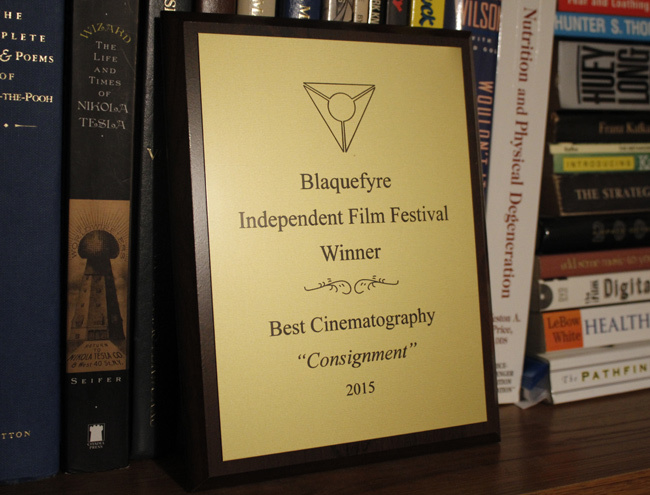 "Consignment" screened at the 2015 Blaquefyre Independent Film Festival on January 24, 2015, where it won the award for Best Cinematography! The award honored the stylish black and white work of cinematographer Lee Clements. Writer/director Justin Hannah and casting director Chris "Drizzle" Davis attended the festival and accepted the award. The 2015 Blaquefyre Independent Film Festival took place January 23-24, 2015 in Centralia, Illinois. The two-day, grassroots festival is presented annually by Little Theater Players and the Centralia Cultural Society. This award is the fourth for "Consignment," having previously won Best Kentucky Short at the 2014 Autumn Shorts Film Festival, Best Short Film at the 2013 World Independent Film Expo, and Most Original Film at the 2013 Floyd Film Festival.